Finan Templeton Dermatopathology Associates is focused on providing the highest level of dermatopathology service to all of our referring clinicians. As board certified dermatologists and dermatopathologists, we appreciate the importance of careful clinicopathologic correlation when examining each specimen, and have been carrying out this mission consistently for the past 17 years. Our experienced board certified dermatopathologists examine all specimens. Reliable, timely telephone access to our dermatopathologists is always available. All specimens are handled and processed on site by experienced histology professionals. Personalized reporting options include online access, delivery to clinician’s office, and/or fax. Results are available within 24 hours of receiving specimen in most cases. High quality hematoxylin and eosin stain- Multiple levels are obtained routinely. 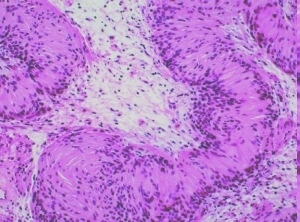 Special histochemical stains are performed when necessary to aid in diagnostic accuracy. Broad range of immunoperoxidase stains are promptly performed on site when appropriate. Difficult and challenging cases may be shared amongst our dermatopathologists. An environment for continuing education is actively fostered. All physicians hold clinical appointments in Emory University’s Department of Dermatology with ongoing involvement in dermatology and pathology resident education. Please contact us if you have additional questions or requests.